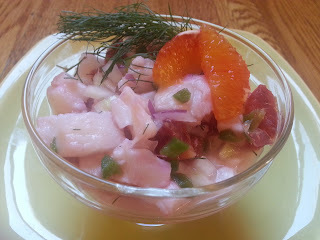 Ceviche is such an easy and healthy dish that I love to make it, especially when my grapefruit tree is in season. 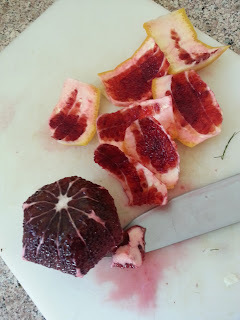 It's also blood orange season and that got me thinking about putting that into my ceviche. Finally, I was at the Yolo farm stand and grabbed a bulb of fennel. Would that work in a ceviche? After all, it works well with citrus. I really didn't see any reason why it shouldn't. After all, I like some crunch to my ceviche from the red onion. I also had this beautiful piece of Chilean sea bass form Certified Steak & Seafood. While some might argue about cutting it up into cubes when you could bake or grill it, I would argue that the better quality of fish makes a better quality of ceviche. Their lovely sea bass is vacuum sealed into 8 ounce servings. This recipe, therefore, is for one. Just multiply it out for more servings, keeping in mind that this is a recipe that calls for your own tweaking. If you like more or less of an ingredient, go ahead and adjust! Certified Steak & Seafood still has their coupon running until the end of February, so definitely try out this beautiful sea bass yourselves. One last thing. I like jalapeno in my ceviche and so that's what you see in the photo above. But it really detracted from the flavors of this version with the fennel, so now I leave it out. Begin with segmenting one of the blood oranges and chopping the fennel and onion. Scoop all into a small bowl. Juice one half of the grapefruit, the lemon, and the other blood orange. Add juice to the bowl of fennel, onion, and orange segments. Cut up the sea bass into 1/2 inch cubes. Add to the bowl. Toss all ingredients together. 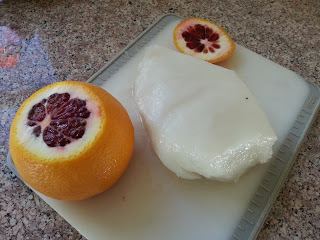 Cover and place in refrigerator for two hours. Serve using fennel fronds as garnish.